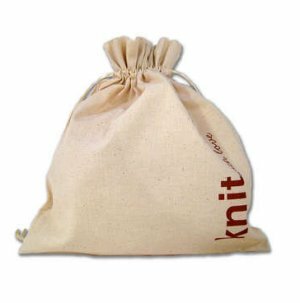 These cute and clever project bags keep your yarn contained and even labeled! The catchy phrases printed down the side allow you to organize your projects efficiently by type. Choose from: Random Project, Tangled String or Paws off. These drawstring bags are available in several fun colors! 11 h X 12 w. Cotton. Chicken Boots Sprinter Bag - Bask and Namaste Oh Snap - Breast Cancer Pink - Train Case are both similar accessories: project bags and baskets.